A good night's sleep refreshes body and mind, but a poor night's sleep can do just the opposite. A study from Washington University School of Medicine in St. Louis, Radboud University Medical Centre in the Netherlands, and Stanford University has shown that disrupting just one night of sleep in healthy, middle-aged adults causes an increase in amyloid beta, a brain protein associated with Alzheimer's disease. And a week of tossing and turning leads to an increase in another brain protein, tau, which has been linked to brain damage in Alzheimer's and other neurological diseases. "We showed that poor sleep is associated with higher levels of two Alzheimer's-associated proteins," said David M. Holtzman, MD, the Andrew B. and Gretchen P. Jones Professor, head of the Department of Neurology and the study's senior author. "We think that perhaps chronic poor sleep during middle age may increase the risk of Alzheimer's later in life." These findings, published July 10 in the journal Brain, may help explain why poor sleep has been associated with the development of dementias such as Alzheimer's. More than 5 million Americans are living with Alzheimer's disease, which is characterized by gradual memory loss and cognitive decline. The brains of people with Alzheimer's are dotted with plaques of amyloid beta protein and tangles of tau protein, which together cause brain tissue to atrophy and die. There are no therapies that have been proven to prevent, slow or reverse the course of the disease. Previous studies by Holtzman, co-first author Yo-El Ju, MD, an assistant professor of neurology, and others have shown that poor sleep increases the risk of cognitive problems. People with sleep apnea, for example, a condition in which people repeatedly stop breathing at night, are at risk for developing mild cognitive impairment an average of 10 years earlier than people without the sleep disorder. Mild cognitive impairment is an early warning sign for Alzheimer's disease. But it wasn't clear how poor sleep damages the brain. To find out, the researchers—Holtzman; Ju; co-first author and graduate student Sharon Ooms of Radboud; Jurgen Claassen, MD, PhD, of Radboud; Emmanuel Mignot, MD, PhD, of Stanford; and colleagues—studied 17 healthy adults ages 35 to 65 with no sleep problems or cognitive impairments. Each participant wore an activity monitor on the wrist for up to two weeks that measured how much time they spent sleeping each night. After five or more successive nights of wearing the monitor, each participant came to the School of Medicine to spend a night in a specially designed sleep room. The room is dark, soundproof, climate-controlled and just big enough for one; a perfect place for sleeping, even as the participants wore headphones over the ears and electrodes on the scalp to monitor brain waves. Half the participants were randomly assigned to have their sleep disrupted during the night they spent in the sleep room. 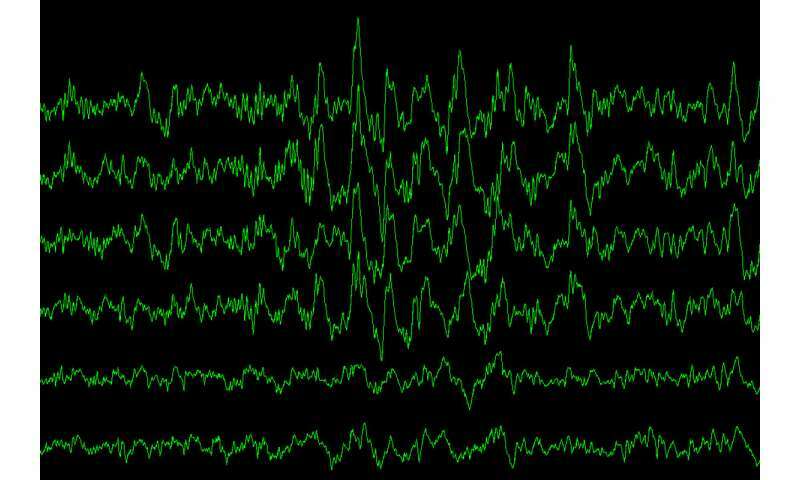 Every time their brain signals settled into the slow-wave pattern characteristic of deep, dreamless sleep, the researchers sent a series of beeps through the headphones, gradually getting louder, until the participants' slow-wave patterns dissipated and they entered shallower sleep. The next morning, the participants who had been beeped out of slow-wave sleep reported feeling tired and unrefreshed, even though they had slept just as long as usual and rarely recalled being awakened during the night. Each underwent a spinal tap so the researchers could measure the levels of amyloid beta and tau in the fluid surrounding the brain and spinal cord. The researchers compared each participant's amyloid beta and tau levels after the disrupted night to the levels after the uninterrupted night, and found a 10 percent increase in amyloid beta levels after a single night of interrupted sleep, but no corresponding increase in tau levels. However, participants whose activity monitors showed they had slept poorly at home for the week before the spinal tap showed a spike in levels of tau. "We were not surprised to find that tau levels didn't budge after just one night of disrupted sleep while amyloid levels did, because amyloid levels normally change more quickly than tau levels," Ju said. "But we could see, when the participants had several bad nights in a row at home, that their tau levels had risen." Ju thinks it is unlikely that a single night or even a week of poor sleep, miserable though it may be, has much effect on overall risk of developing Alzheimer's disease. Amyloid beta and tau levels probably go back down the next time the person has a good night's sleep, she said. "The main concern is people who have chronic sleep problems," Ju said. "I think that may lead to chronically elevated amyloid levels, which animal studies have shown lead to increased risk of amyloid plaques and Alzheimer's." Ju emphasized that her study was not designed to determine whether sleeping more or sleeping better reduce risk of Alzheimer's but, she said, neither can hurt. "Many, many Americans are chronically sleep-deprived, and it negatively affects their health in many ways," Ju said. "At this point, we can't say whether improving sleep will reduce your risk of developing Alzheimer's. All we can really say is that bad sleep increases levels of some proteins that are associated with Alzheimer's disease. But a good night's sleep is something you want to be striving for anyway."